Twenty-five years have passed since Tamra Ryan rode a bike more than ten miles. This season, she’s biking to work almost every day. What changed Tamra’s commute? In September, Perkins Coie Human Resources invited its 735-strong Seattle workforce to participate in King County’s new Green Bike Project. Tamra’s daughter Kiersten was now a teenager—And Tamra wanted to get back in shape. “I’d like to do more to help the environment and reduce traffic,” says Tamra. The goal of the Green Bike Project is to reduce drive alone commute trips by providing resources to get employees biking and taking the bus. Participants pledge to reduce drive-alone commuting by 60% from September through May (there’s a grace period during the rainiest season, mid-November through mid-February). 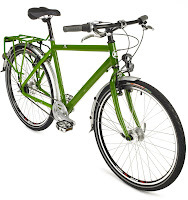 In exchange, each participant receives a free Novara commuter bike, or a tune-up from REI for their existing bike. For her fall birthday, Tamra also received bike apparel and bike books, including Urban Bikers’ Tricks and Tips by Dave Glowacz. Before her first day biking, Ryan visited a local bus stop to watch how other cyclists loaded their bikes on the Metro bike racks. At the mandatory Green Bike Training Class, Ryan learned about bike safety, maintenance, and defensive riding skills. The first day biking to work was still intimidating. The most important lesson she learned: Assume you are invisible to cars and pedestrians. Now she knows how to ride in the city without riding on sidewalks. Ryan layers in synthetic apparel with as much eye-catching yellow as she can tolerate. Thirteen Perkins Coie employees registered for the Green Bike Project. Cumulatively through December, the pack has logged 846 days of bike commutes and 4,690 miles. Assuming an average auto gets 20 miles per gallon, the Perkins Coie cyclists have saved almost five tons of carbon dioxide from entering the atmosphere. The firm offers warm showers and bike lockers in the employee parking garage. One Green Bike commuter, Craig Burt, increased garage capacity by selling his family’s second car. Between October and mid-December, Tamra drove her car less than ten times, until the first snow. During her fall bike-bus commute, Tamra logged 708 miles—a respectable 15% of the group’s total. “I miss it if I don’t ride,” says Ryan; “it has become an enjoyable habit.” Since her bus route offers limited service outside rush hour, bicycling also enables Tamra to stay later at work when necessary. Tamra’s new commute also blows attention on her. The Novara’s internal geared hubs and front hub-controlled headlamps interest cyclists and non-enthusiasts. And, of course, witnessing several hundred green bikes during rush hour adds to the sense of mystery. Tamra is a new member of Cascade Bicycle Club. She looks forward to taking Education Foundation classes, to joining some organized rides, and, someday, to taking her family on a multi-day cycle touring vacation. The Green Bike Project was made possible through contributions from 22 employers, as well as its partners: Cascade Bicycle Club, King County Metro, REI and Washington State Department of Transportation. For more information, visit: www.greenbikes.net. Scott Marlow was marketing director for Cascade Bicycle Club from 2001 – 2005. The Club record-holder for the shortest commute (under six-seconds), Marlow works from his home office in West Seattle. Nominate a cyclist of the month!